This book is definitely a MUST READ for anyone. I recently finished it and was completely blown away. This is a summary of a paragraph on page 148: Matthew and a friend were watching ESPN at 10:30 one night when they had an itch to serve someone. The only way that it could be scratched was to get up and find someone to serve. They drove around until they found a homeless person, picked him up, and bought him some food. Serving is addictive. This book tells Pastor Matthew’s story and other stories who have been impacted by the Dream Centers ministry. I personally had the opportunity to hear Pastor Matthew and to meet him at All Access 2011 and SEE the PASSION he truly has for serving others. I encourage you to read this book ASAP. 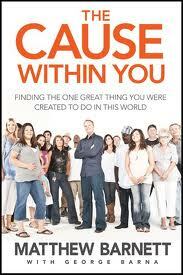 This entry was posted in Book Review, Discipleship, Leadership, Life. Bookmark the permalink. I couldn’t agree more! I’m still reading the book (currently in Chap 9) and it’s shaken my world! So many times we make ministry so hard to do, with all the procedures and steps to take—it loses meaning fast! But when you’re heart is as Matthew’s on page 148, ministry isn’t a struggle, a drain, or even an obligation—it’s the best addiction you can have! My book arrived today! I love to read. Great post.